A Little Goes a Long Way ~ With Love and Co.
Our body butter seems to be flying off the shelf and is truly our number 1 seller. It is what got us started, and is a main stay in our daily sales and with any luck, it will continue. I guess the purpose of the article is that I wanted to highlight a key feature of the product. That being that a little bit goes a long way. If you are a current customer of ours you know that our products are made from all natural raw products. We work really hard at ensuring that we have the finest, ethically produced, organic ingredients, and that we use raw product. Our body butter, which is the base of all of our items, is made from raw unrefined butters, shea, cocoa, mango, etc. When we make it, we essentially build the recipe by heating up the raw butters using strictly controlled temperatures. Once all of the ingredients are at the right temperatures, we blend them thus creating the body butter. Immediately following the blending process, the butter is ready to be jarred. We do this immediately and put it into the jars, small and large, hot. Unlike so many on the market, we don’t whip our body butter. 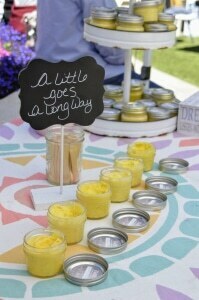 Jarring the body butter while hot provides a very soft, but yet very dense product. Providing our customer with a honest, full jar of body butter has been a signature of our from the beginning. We certainly realize that whipping air into the body butter would provide us with a little more profit, but at what cost. Our integrity? Our honesty? Certainly integrity and honesty are high on our list of our personal traits and of those that work with With Love & Co. Why would we not have the same attitude toward our products. The benefit of forgoing the whipping process is that our body butter goes a long way. Or as the sign in the picture states, “A little goes a long way”. Come by one of our many farmers markets and test it out for your self. Take a small pea size amount from one of our sample jars (lavender, sugar bear, lemongrass, coconut, toasted vanilla, healing balm) you will agree. A little goes a long way at With Love & Co.